Paper shrines are easy to make. I use them in art journal spreads, and if the paper is sturdy enough, they can stand up and be used as a table shrine. 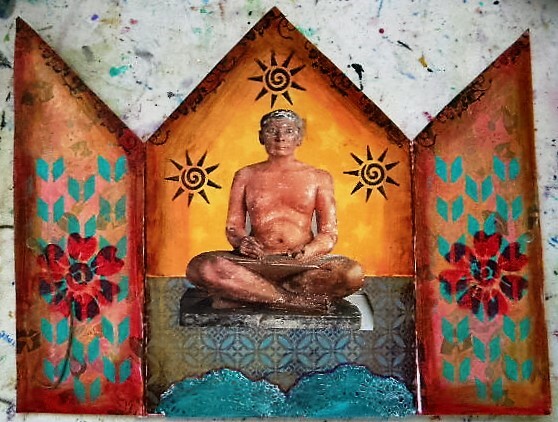 The above shrine was made with heavy-duty watercolor paper. 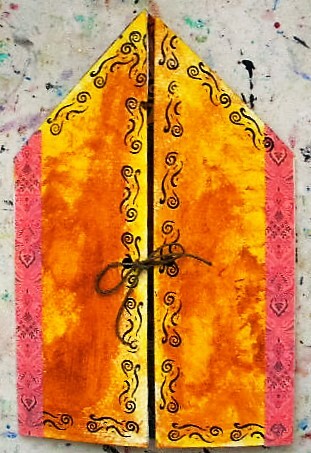 I added the doors and altered the paper. Lots of gold! It doesn’t show well in the picture. As an icon I used a picture from a guide book of the Louvre. He’s some Egyptian scribe. It doesn’t have to be a religious icon. Whatever you want to celebrate. You can make a shrine with your goals or passions / dreams, or an ode to Nature. Here is another shrine I made from card stock. Won;t make the art journal spread bulky when added. I used a digital picture of Mary in this one, added a frame and gold paint. As bling I used some gilded and colorful border segments. I made a video of the process and you can watch it HERE.